When the Grisaille has dried, we start painting in color. For the first layer of Glaze, we mix Ultramarine and Charcoal Grey. As a Medium, we use Stand Linseed Oil well-diluted in Turpentine. The Glaze is easy flowing and transparent yet dark. Use long hair Hog Brushes that are stiff and can be loaded with plenty of paint. After the first layer of Glaze has been applied, we can put the canvas aside to dry or work on other parts of the composition. We continue painting when the first layer of the Grisaille is dry. This time, we use pure Ultramarine thinned with Stand Linseed Oil diluted in Turpentine. The paint mix can be tested directly on the spot, to see if the color matches your expectations. You can take a bigger brush to spread the Glaze thinly and evenly over the surface. While the Glaze is still wet, we proceed with the shaded areas of the drapery. For this, we prepare an opaque mix of Ultramarine, Charcoal Grey and White. The white color makes the mix opaque. No medium is required here, as we need a dense layer of paint. This opaque mix is used over all shaded areas. A lighter tint is prepared by adding more White to the mix. This is used for mid-tones. We apply this mix sketchily with loose brush strokes. For highlights on the draperies folds, even more White paint is added, making the tint almost white. 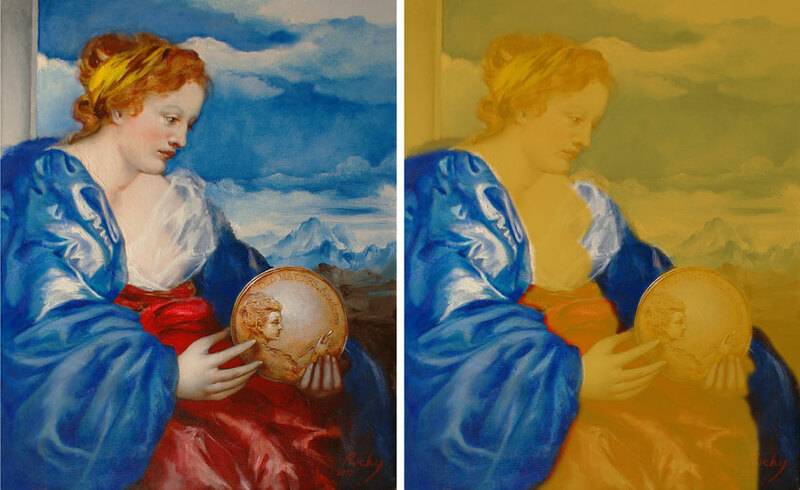 When the previous layer of the Underpainting has dried, we can continue painting. Let’s strengthen the highlights over the bending of the folds with extra passages of White paint. Paint is applied with loose brush strokes… as this is still an Underpainting, it can be handled in a generalised way. We continue working on the draperies after the surface of the painting has completely dried. Titanium White is mixed with Ultramarine, and thinned with Stand Linseed Oil. This gives a non-transparent Glaze. We cover the entire area of the drapery. This opaque veil-like layer helps to create a complex optical look. It doesn’t matter that the drapery looks sketchy at this step. Later, it will be transformed into a clearer design. This is what our dry painting looks like. At this point, I revised the composition once again, made a couple of new sketches, and decided that the painting will benefit from a new design. It is fine to amend the original design if you think your changes will better fit your creative idea. for a composition to be amended during painting. Using a very simple unthinned mix of Titanium White and Ultramarine, we draw with a brush a new design of the sleeve. In the following step, we place highlights. For this task, we take pure Titanium White and apply it thickly, leaving relief traces of brushstrokes. Such relief is achieved by using undiluted paint. Gradually, we advance from a generalised depiction of folds to more details and nuances. However, we shouldn’t overdo our details or smooth out the surface too much. When our shades and highlights are roughly in place, we proceed with mid-tones. 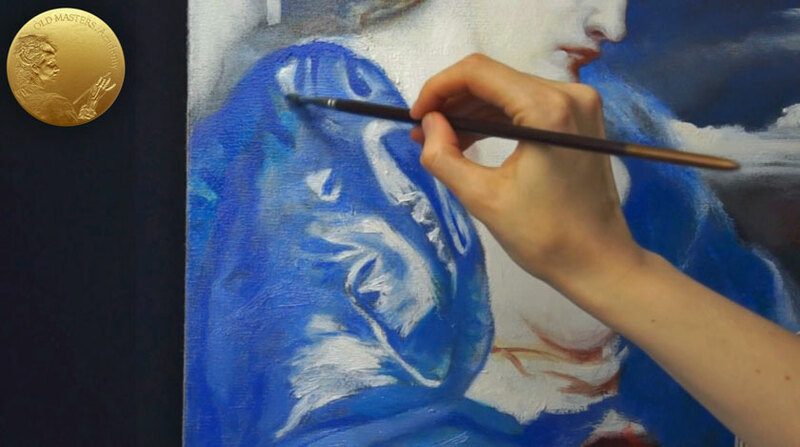 For this, we intermix the already applied White and Ultramarine right on the canvas. This lower part of the garment is designed as a separate piece. The structure of folds here is done differently, to emphasize that they are made of another kind of fabric. The cape, unlike the sleeve, has softer, roundish folds. As you can see, I rely on preparatory sketches while painting the composition. Some ideas are created during the process, so I change the design and even colors as I go. This keeps me off naturalism, which was not favored by the Old Masters. They learned from nature, but never slavishly imitated it. That is why working from sketches helps to improve your imagination. Working from photos is acceptable, providing that you don’t copy them, but use them as reference materials. The knowledge of anatomy is essential for painting figurative artworks. It helps portray believable figures and portraits, whether you paint from life or from any reference materials. Using photographs can be poisonous for visual art. Without your artistic translation from “photo language” into a language of art, it’s not possible to achieve the High Standards of the Old Masters. The next session continues over a dry surface. This is Phtalo Blue mixed with Stand Linseed Oil. Stand Oil is thinned with Turpentine to increase flow. We add an additional color nuance to the Ultramarine drapery. This is optional, and if you wish, you can skip this step, but it can really add more richness to the overall blue color. Now we can deepen up the tonal value of the shaded areas of the folds. For this task, we use Ultramarine thinned with Stand Oil. (Stand Oil can be diluted in Turpentine for better flow). Using a soft brush, we apply Glaze in deep folds, and also darken the border between the lighted and shaded areas of the folds. In some places, folds can be merged together into one generalised mass and left in details in other areas. The sleeve that is further away can be darkened even more by being covered with a less transparent layer of Glaze. After that, we set the painting aside to dry.